Orange blossom, orange marmalade, peach and nectarine, prosciutto and melon. Oyster shell freshness and wet stone minerals. Sweet and pliant fruit-filled palate. Real depth and extract. Honey and baking spice. The deep, deep flavors linger long on the layered rising whistle-clean finish. Great pedigree. As usual the broadest, richest and most Californian of our four classic designate chardonnays, and in some stylistic regards, the natural partner to Ryan Pinot Noir – why not pair them together over a long leisurely dinner? There’s a power here and deep booming resonance that comes from low-yielding old vines planted in shallow marine-based soils with just the right amount of clay to give body and roundness. It’s a very aristocratic wine which is why there’s a legion of other producers lining up to work with these two special vineyards, such is their quality and reputation. 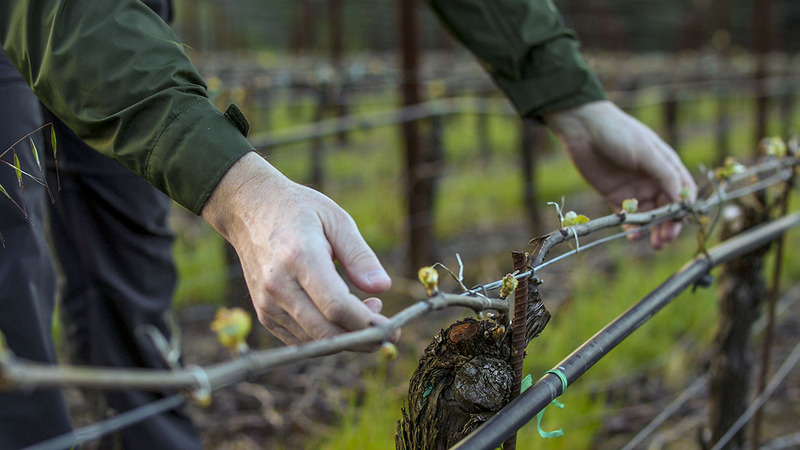 We are among the first to harvest our respective section of each vineyard as we’re focused on a style that harmonizes the broad richness these vines naturally wish to produce, with the delicate savory elements that provide lift, freshness and detail. This way the final wine doesn’t become heavy or fat at all. We get the best of both worlds, depth and character but airy and intense – all in proportion, no awkward edges. Rich, broad and powerful fruit-driven wine with old vine sinew and a clean mineral spine. Lots of nuance and detail.